From 1890 to 1907, Ballard existed as a growing, separate city. In November of 1906, 996 of Ballard’s citizens voted to join the city of Seattle. (Voting against the measure were 874 residents, of about 17,000). Water supply and other infrastructure needs have been cited as pressures contributing to annexation. On the day the City ceased to exist, the Ballard City Hall was draped in black crepe, and the flag on the city flag pole hung at half mast. 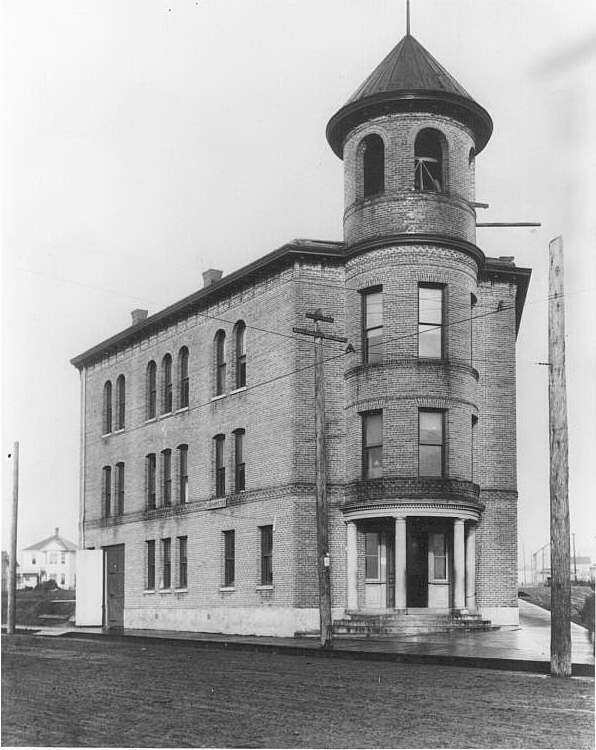 Though Ballard’s City Hall building has disappeared from Ballard Avenue, the bell originally part of the building rings, thanks to a Small and Simple grant project several years ago, and the construction of a tower to house the bell even earlier. Next time you’re in the area, stop in for a moment and try to imagine the day in which the growing population of Ballard joined with its larger neighbor, Seattle. You might be interested to read this brief article, Ballard: Still a City Within a City. The article was originally a poster was written by Alan J. Stein and designed by Marie McCaffrey. Search our archives for more pictures of Old Ballard. Dedicated to the preservation and celebration of Ballard history.